Whether you're looking for last minute Christmas gift ideas, or toys to stock your store with once the holiday shopping season is over, TDmonthly's December Staff Picks include high-quality toys and games for kids of all ages. With five favorite mini microbes dressed up for Christmas: a Stomach Ache Gingerbread Man, a caroling Sore Throat, Frosty the White Blood Cell Snowman, an angelic Nerve Cell, and an exclusive Amoeba in sparkly gold lamé, only available in this set. Racin' Rody Blue by TMI TOYMARKETING INTERNATIONAL INC.
Blue is one of the new colors of the Gymnic Line’s NEW Racin’ Rody Horse. 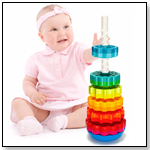 The Italian-made line is a favorite with children, who learn balancing and coordination while hopping on their Rody. Can be used for Rody Races. Used in therapy for special needs children due to its softness and ride-on qualities. Made of heavy duty, latex-free vinyl. Inflates according to size and weight of child (inflation by adult). Surface washable with soap and water. Base is available for transforming to a Rocking Racin’ Rody Horse. Racin' Rody is available in 3 colors. Launch date: March 2012. The rugged and ready for action chrome detailed helicopter features motorized main and tail rotors, a set of jet propulsion turbo engines, retractable landing gear, and 3 authentic sounds for ignition, take off and fly by. The working lights include running lights that work in flash or steady mode and a set of high powered, pivoting searchlights. The see through, illuminated cargo bay has a push button release for the cargo door, which lowers as a ramp for the Rescue vehicle, a 6-door SUV style truck featuring a friction motor, real working lights, retractable emergency roof lights, and chrome detailing. Launch date: 2012. Men of Iron relates the thrilling adventures of a young man seeking justice for himself and his family in fifteenth-century England. With his father unfairly outlawed by King Henry IV, Myles Falworth faces enormous odds before he can become a knight and champion his family’s cause against powerful foes. With the help of loyal friends, Myles demonstrates courage and persistence as he confronts his opponents one by one, winning self-understanding and love along the way. In addition to being a classic adventure, Men of Iron offers fascinating details of castle life and of the long road to knighthood. This book is sure to become a favorite of any boy or girl who loves adventure, and will turn anyone new to the medieval era into a lifelong devotee. Written by Howard Pyle, unabridged reading by Jim Weiss. Award winning! The start of many a story begins right here! Robin Hood, Magician, Royalty, Wizard, Superhero - All need a great cape like this! Fairy Finery believes capes are the versatile start of imaginative playtime. Made of washable, soft poly suede, closes with Velcro at neck for easy wear and safety. The full hood has a tassel to finish it in style. Colors: Forest Green, Brown, Black, Red. The Classic set consists of 36 varieties of maple blocks. Painted with non-toxic water based acrylic paints and sealed with organic beewax. 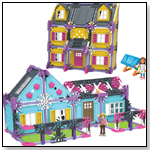 The littleBits Extended Kit is the third and biggest kit by littleBits. We hand picked all of the most fun, mechanical Bits and crammed them into one double-decker kit. This kit contains all the Bits one needs to make littleBits creations. It features a dc motor, motion trigger, buzzer, 2 wires, and more. About Face by eeBoo corp.
Other products from eeBoo corp. 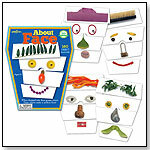 In this fun game, kids create an endless cast of characters as leaves, ribbons, coins, seashells, paper clips and a variety of found objects combine to make millions of faces. 160 object images. Made from 90% recycled materials. PathWords Jr. is a clever word search puzzle with a twist. To complete each themed challenge, place colorful Tetris-style puzzle pieces over letters to spell a word forward or backwards. With its unique design and tactile appeal, PathWords Jr. builds spatial reasoning and strengthens vocabulary with clever graphic hints and funny word play. 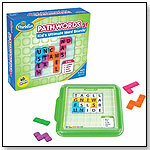 An ideal game for children ages 6 and up, PathWords Jr. instills a lifelong love of word puzzles and logic games. Awards: Dr. Toy Best Vacation Children's Product Award; ASTRA Best Toys winner in 2011; Creative Child Puzzle of the Year; Parents' Choice (Gold); Oppenheim Toy Portfolio (Platinum); Teachers' Choice; National Parenting Publications Award (NAPPA). — As of 11/15/2012 this product had 4.9 out of 5 stars from 17 reviews on Amazon.com. Pros: Helps build logic and spacial skills; helps kids develop literacy skills. Set contains 20 pieces. 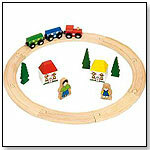 Perfect way to begin - starter set of circular track, brightly colored train & two carriages to push around the track, three colorful houses and trees included. Additional track pieces and accessories can be added as required. 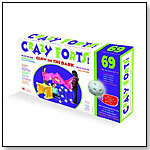 Glow in the Dark Crazy Forts by CRAZY FORTS INC.
Other products from CRAZY FORTS INC.
Glow in the Dark Crazy Forts are a unique, award winning, building and creative toy. Glow in the Dark Crazy Forts come with 69 child-safe glow in the dark toggles and rods that join together to build any play space from your child's imagination. Create a "Cave" one day, an "Igloo", "Pirate Ship" or "Castle" the next . put the pieces together in different configurations, cover with bed sheets and "voila." kids have a unique new play space every time. Crazy Fort is powered by a child's imagination. Each Crazy Fort Kit contains 25 geometrically precise balls that glow in the dark and 44 sticks that connect to create a multitude of possible play structures. The Glow in the Dark kit contains balls that glow in the dark for hours when held to the light. Marvel at the creatures that shared the earth alongside Tyrannosaurus rex with the Sue and Friends TOOB®from Safari Ltd®. These collections of individually hand painted miniature replicas feature vibrant colors, professional sculpting, and accurate detail. 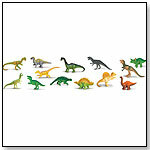 Packaged in a reusable acetate tube, this set contains 13 colorful and accurate dinosaurs. Hand painted figures measure 1.5” to 3” (4 to 7.5 cm) and are suitable for ages 3 and up. All Safari Ltd® products are 100% guaranteed and lead free to ensure children’s safety. Launch date: 2013. With Xyloba mezzo kids can create a great variety of melodic marble runs, using the 8 interchangeable sound modules to produce complex melodies. Made in Switzerland. This handcrafted wood set includes seven pieces: A bucket drum with a natural skin head, a pair of drum sticks, a single jingle stick, a handled castanet and a pair of mini maracas. Fun for the whole family or class! Includes a parent/teacher friendly activity guide for ideas on using the items to encourage child development. — As of 10/30/2012 this product had 4.6 out of 5 stars from 26 reviews on Amazon.com. Pros: The drum makes a nice noise; fun for kids on their own or in groups. 5" YooHoo Mermaid Asst. by AURORA WORLD INC.
5" YOOHOO MERMAID ASST. 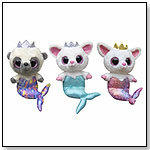 Part of the YooHoo & Friends Wanna Be line, these yoohoo mermaids have colorful fins and tiaras, and play fun sounds when kids sqeeze their bellies. 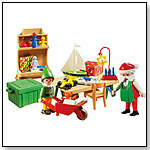 Santa's Workshop Carrying Case by PLAYMOBIL INC.
Other products from PLAYMOBIL INC. Kids can have fun even when they're on the go with the Carrying Case Santa's Workshop. Set includes Santa, elf, gifts, toys, wheelbarrow, table, chair, and other accessories that all fit into a green, easy to take-along case. Chef Stovetop Set by HABA USA/HABERMAASS CORP. This set comes complete with a wooden cook top. 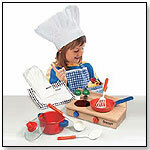 Content: apron, frying pan, wooden stove top, pot with lid, and salt & pepper shakers. Dishwasher safe - microwave safe - suitable for food contact - PVC free. 10 pieces. Throughout history, many famous landmarks have been deemed "Wonders of the World," from ancient sites to modern-day feats of architecture. Inside this kit users will find ready-to-fold templates to create 6 stunning, highly detailed, 3-D paper models of some of the most famous structures of anciet and modern times. Includes a 56-page project book and pre-punched and scored project sheets to make 6 models. Launch date: August 29, 2012. Launch date: October 2012. The land of dinosaurs comes back to life in an amazing detailed scene filled with all types of favorite dinosaurs. After completing the giant floor puzzle, kids will have a blast naming all the different dinosaurs. Launch date: March 2012.